Description: This may be the most important book you HAVEN'T read. Charles Capps shows how there is only one way to achieve true and lasting success: through the Word of God. The image that God's Word will build inside of you can become the most powerful force in your life. That image will cause you to succeed where others fail. God's Word will motivate you to live a positive and successful life. It will bring you success in every part of your life--spiritual, physical, financial, and social. Many books have been written on the subject of positive thinking and success, but they focus on the mental realm only and lack a spiritual connection. There is only one way to achieve true and lasting success and that is found through the Word of God. 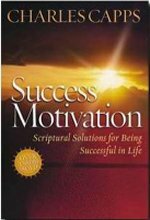 The spiritual truths from the Word of God changed Charles Capps' life, and by absorbing the contents of Success Motivation your life will be changed too!